Rhodes private sunset cruises or daily tour cruises offer you an excellent oppotunity to experience the coastline of Rhodes. 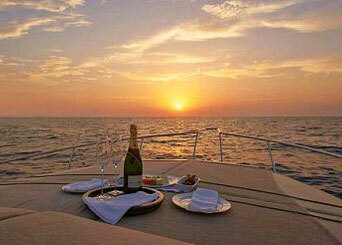 As the sun sinks low onto the horizon step aboard for a champagne sunset cruise. Enjoy the magic hour or two of golden light as it casts its spell over the coastline and glassy water. The most relaxing way to enjoy this special time of day.Why not surprise a loved one on a special occasion or enjoy the cruise with friends. Shoes cannot be worn on board the yacht. Flowers or gifts can be arranged for a special occasion. Yacht can be arranged for cruises to / from Lindos at additional fee. Includes: Wine, beers, soft drinks or champagne for the couple fruit salad.